The Dallas Trinity River crested at 38 feet Monday and fell lower through the day, but emergency planners still held a meeting Monday morning to prepare for possible flooding. 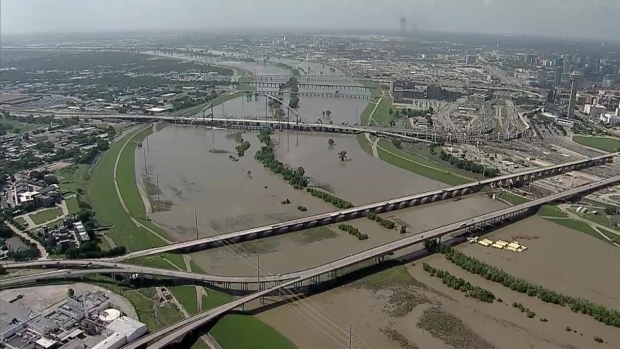 The Dallas Trinity River crested at 38 feet Monday and fell lower through the day but emergency planners still held a meeting Monday morning to prepare for possible flooding. It comes as a relief to Arlington Park resident Regina Waters. Her neighborhood near Stemmons Freeway is surrounded by the old Trinity River channel, the path of the river before the Dallas levees were built. The old river channel is still a key storm water drainage path and her neighborhood has flooded many times over the years. The high water still attracted sightseers at the Continental Viaduct park beside the Margaret Hunt Hill Bridge. Meteorology student Sean Toner said it looked impressive. “I’ve lived here about seven years now and I haven’t seen it this high in that time,” he said. The crest of 38 feet was below the 40 foot level that can cause some flooding concerns in areas not protected by the Dallas levees. Vaz said emergency planners are still watching the weather. “The worst of it is passed for right now, until the next round of rain. And we are really happy with the forecast that we are seeing right now,” he said.